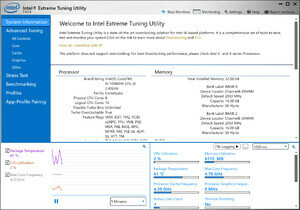 Intel Extreme Tuning Utility is the official overclocking application for owners of Intel CPUs and motherboards. It can tweak CPU settings, RAM and graphics. The main system information panel of Intel Extreme Tuning Utility provides you with all of the relevant details about your system and its hardware. This including the CPU model, number of cores, features; The installed memory and its speed; The graphics processor installed with its dedicated video RAM and a few few details about the BIOS and motherboard. Version 6.5.1.321 is a freeware program which does not have restrictions and it's free so it doesn't cost anything. For security reasons, you should also check out the Intel Extreme Tuning Utility download at LO4D.com which includes virus and malware tests. Additional screenshots of this application download may be available, too.